The inscription are the words of Justinian: "She gives justice to all." Beneath the overarching figure of Justice we see, from left to right, three women representing the classical virtues of Fortitude, Prudence, and Temperance. Each of these personified virtues is attended by her theological counterpart: Charity, Hope, and Faith. Fortitude — internal strength and courage — is clothed in battle armor. With her left hand she strokes the head os a lion, and ancient symbol of power. In her right she holds the powerful oak branch of the Pope’s Della Rovere family. Charity plucks the acorns from the branch, symbolizing the sustenance produced by a just expression of Fortitude. 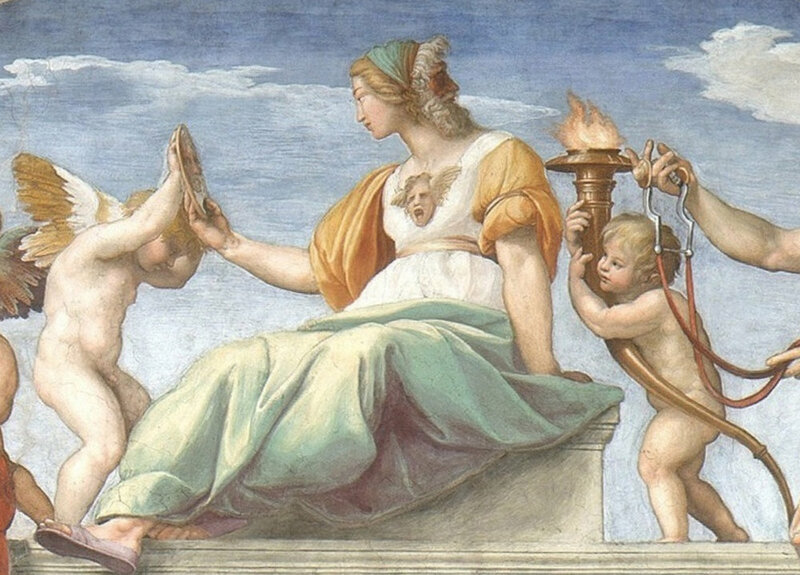 On the right side of the image a seated Temperance old the reins of restraint as the putto on her left points, in a gesture reminiscent of Plato’s in the School ofAthens, to the heavenly source of the virtue. Between Fortitude and Temperance, the female figure of Prudence occupies the central position in the realm of justice. The gorgon-head on her tunic represents the force necessary to repel the temptations off imprudence. She gazes into the mirror of self-knowledge in the present while the ancient male visage on the back of her head looks back to the past for guidance. The putto at her side holds the flame of illumination to light the path of Prudence through time. Another interpretation of the figure of Prudence is that the woman represents not only Prudence but Wisdom, one of the cardinal virtues as defined by Plato. If that is the case, then the mirror represents self-knowledge. Traditionally, prudence is often represented with a mirror and a serpent. In the context of the Stanza, however, the serpent might be misinterpreted as an image of Satan. So in this fresco, the snake is transformed into a serpentine beacon of flame that enlightens the backward-facing male head of Prudence. The restraining bridle of Temperance overlays the flame-bearer, its coils mirroring the shape of the torch. The gorgon head pictured on the front of Prudence reminds the viewer of the story of Perseus, who slew the monster, then attached the head to his own shield to defeat his enemies by appropriating the power of evil. Click for two more images of a "Janus-headed Prudence"
The lower frescoes present the human characters who must carry out the dictates and spirit of Justice: Justinian receives the Corpus Juris Civilis from the Byzantine legal scholar Tribonian. 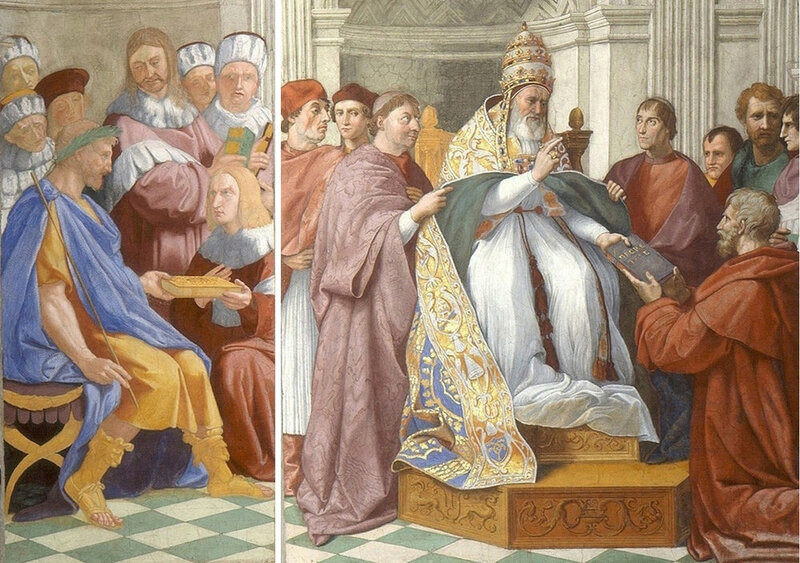 On the right, the Dominican friar Raymond of Penyafort gives the codes of canon law to Pope Gregory IX. 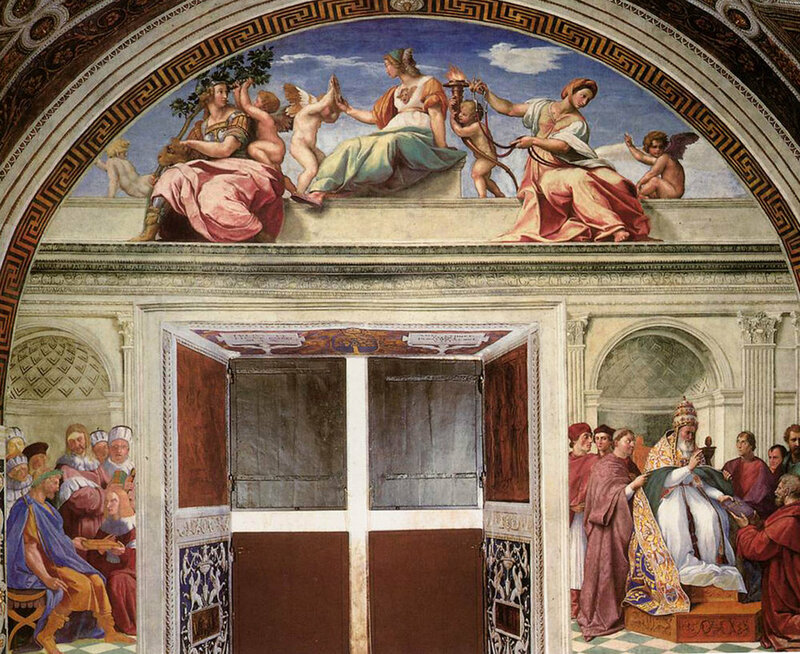 Note that these images show the same horizontal (for earthly matters) and vertical (for heavenly matters) gestures that we see in the School of Athens and the Disputation.